John Winslow Irving was born in Exeter, New Hampshire, in 1942. He is the author of nine novels, among them A Prayer for Owen Meany and A Widow for One Year. Mr Irving is married and has three sons; he lives in Toronto and in southern Vermont. "Writing a novel is like swimming in the sea; writing a film is like swimming in the bath. . . . 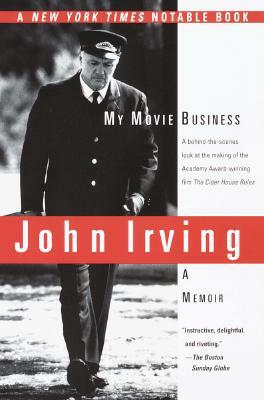 This short, amiable book is John Irving's personal history of seeing--or not seeing--his novels made into movies. . . . The book digresses charmingly and effortlessly into related subjects. There is a beguiling memoir of his grandfather, an eminent surgeon; a brilliant and passionate argument for the freedom of women to choose abortion . . . observations on the origins of his novels, and so on. . . . Irving remains cooly objective, and it is clear why: he is a novelist, first and foremost, and his attitude toward the movie business is informed by this security and certainty. . . . Irving has done us [writers] proud."